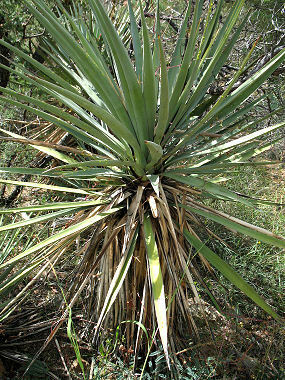 Schott's Yucca is a member of the Agave Family. This large agave has bluish green bayonet shaped leaves that grow to 2.5 feet in length with smooth, reddish edges and a sharp point. Leaves grow from a central location to form a large rosette. The plant can typically be found growing along hillsides and in canyons at elevations between 4000 and 7000 feet. Native Americans eat buds, flowers and young flower stalks of the Schott's Yucca. Schott's Yucca blooms between April and August, producing a large flower stalk, which grows to 18 feet in height. The stalk produces a long cluster of white, waxy, bell-shaped flowers, followed by green banana-like fruits, which grow to 5 inches long.